Serbia, with just over seven million people, is isolated. Once the centre of the Socialist Federal Republic of Yugoslavia (SFRY), Yugoslavia led by Josip Broz Tito as head of the League of Communists of Yugoslavia from 1945 after successful partisan struggle during the war until Tito’s death in 1980. Serbia has been dismembered during a bloody civil war in the 1990s. It is now land-locked, edged to the east and north by former Soviet bloc countries which it dramatically broke from in 1948 – Bulgaria, Romania and Hungary – and to the north-west, west and south by its former associated republics in the federation, Croatia, Montenegro, Kosovo and Macedonia. Even the naming of these other rival entities in this context is now filled with dispute and unresolved enmity. Serbia stands alone, with the exception – an irony of history – of Russia, and it is a country now with increasing trade-links with China. The break with Stalin in 1948 opened up a period of so-called ‘self-management socialism’ and some degree of freedom of manoeuvre for leftist dissidents and intellectuals who were then able to connect with the anti-Stalinist left outside the country. Meetings that included the ‘Praxis’ philosophers functioned as a relay-point for radical ideas not only from Marxist traditions outside Yugoslavia but also for a current of Yugoslav thought that was re-thinking what was possible in conditions of isolation. Tito tried to break that isolation of Yugoslavia through active participation in the Non-Aligned Movement (NAM) which was founded at Brioni (which is now in Croatia) in 1956, a movement which now continues with 120 nation-state members. The Yugoslav experiment thus became a touchstone for many socialists looking for an alternative to the Soviet model, an alternative to Stalinism, but it failed, and the reasons why it failed ripple on through Serbia today. It was a country that attempted to build socialism in one republic under siege, under pressure both from Stalinist Eastern Europe faithful to Moscow and from capitalist Western Europe determined to undermine any claim for the success of an anti-capitalist alternative. It failed not only because it was isolated but also because ‘self-management socialism’ was a fiction that patched together workers in different competing local enterprises with a state in which there was still the iron-grip of the League of Communists, an apparatus of censorship that held the regime in place. Now with the destruction of the old socialism what remains is authoritarian nostalgia and intolerance of difference. On 10 May 2017 Bernard-Henri Lévi, one of the leading figures in the right-wing Nouveaux Philosophes group in France in the 1970s, got a cake in his face at the Belgrade Cultural Center. The protest against Lévi was orchestrated by Novi SKOJ, a ‘communist’ youth group with a tiny membership but control of one of the old League of Communists headquarters. The Novi SKOJ activists unfurled a banner (in English) reading ‘Bernard Levy advocates imperialist murders’ and they shouted abuse at Lévi over his support for the 1999 NATO bombing of Serbia. The SKOJ website declares itself to be against imperialist intervention in Cuba and Venezuela, and a young activist interviewed on the radio after the event declared that China was a good model for good economic commonsense combined with socialist values. The cake protest is indicative of the level of continued anger in Serbia, not only at the bombing as such, but of the isolation of the regime, with some politicians keen to take Serbia into the European Community, and others closer to Putin. The anger flows into disruption of cultural events that appear to be in line with Western European agendas, into seething resentment at the dismantling of the old socialist state structures, and into nationalist protest that spills quickly over into racism, including antisemitism. It is no accident, perhaps, that Lévi (in Belgrade to launch his new film project Peshmerga) was attacked; a prominent Jewish intellectual, he fits the bill as one of the visible enemies onto which the woes of the old Stalinist forces, now willing to engage in Red-Brown alliances to match what is happening in Russia and Ukraine can project their hatred. One young activist told me again about the incident but said the protest was against the French anthropologist Claude Lévi-Strauss, an innocent slip we laughed about at the time but could have explored further; such are the chains of the symbolic we relay as we speak, unable to think through at every precise moment, about their manifold contradictory meanings. There is sympathy in Belgrade, even among some ostensible leftists, with the Orbán regime in Hungary that is busy demonising George Soros as the architect of Western intellectual intervention. As the Slovene Slavoj Žižek pointed out, one of the signifiers of antisemitic discourse in the Balkans today is ‘Soros’, emblematic of the current paranoid fascination with the idea that Jews are deliberately arranging the migration of the Muslim hordes from the Arab world into Europe, with Serbia one of the first stops for this Judaic-Islamic destruction of their own culture. Remember that Žižek himself had declared during the NATO bombing that it was ‘too little, too late’, a phrase that was quickly removed from later versions of his widely circulated discussion of the events at the time, and his face appears graffitied on Belgrade buildings with the cryptic legend (in Serbian Roman script) ‘Sing like Slavoj’ (a pun on his name, which is similar in sound to that of a small songbird in Serbian). While SKOJ represents one of the most regressive and marginal nationalist strands of ‘Yugostalgia’ – a local variant of nostalgia for the old socialism – there are other variants of this kind of politics at the centres of power. The party of Slobodan Milošević – the Socialist Party of Serbia (with a Cyrillic website) – is in coalition with the Democratic Party and with the newly-elected nationalist president Aleksandar Vučić, who is currently head of the Progressive Party (Srpska Napredna Stranka – SNS) but well-known as a one-time activist with the far-right ‘Radical Party’. He served as minister of information under Milošević. Protests reached 50,000 on the streets after Vučić’s election in April 2017. The April Belgrade street protests were partly about voting irregularities, but also about the austerity, privatisation and ‘security’ measures to be reinforced by the Vučić regime. The SNS and the Socialist Party effectively co-opt ‘socialist’ rhetoric about the good old days while steering the country in a neoliberal direction. There is also a tiny Communist Party of Serbia run by its President Joška Broz, Tito’s grandson. The Serbian Government website judiciously balances support for various dictatorships that will engage in economic deals. Once strongly opposed to the EU, Vučić is pushing negotiations to join it. And he is rewarded by kind words from Angela Merkel who is more than happy to overlook Vučić’s youthful flirtation with fascism and current authoritarian policies; while Merkel presents herself to her European audience as tolerant generous host to refugees, a strong state in Serbia is perfect for her insofar as it functions as a heavily securitised state apparatus to prevent refugees from the Arab world crossing its borders and so then making their way to Germany. Anti-immigrant practice is in this way encouraged inside Serbia. In early May 2017 the Serbian Commissariat for Refugees and Immigration forcibly removed 1,200 refugees from the centre of Belgrade on the pretext that the building needed to be demolished. The officials carrying out the evacuation wore protective clothing and sprayed the refugees from Afghanistan and the Arab world with disinfectant. There were protests by NGOs working with asylum-seekers, and there is some grassroots mobilisation by progressive groups like No border Serbia. There is a deep antisemitic and nationalist dynamic in much mainstream organised politics which is fuelled by a particular preoccupation with Serb identity under threat and with the centrifugal process that was unleashed in the final years of the SFRY. There is, for example, a motif of victim-hood that Milošević used to mobilise the Serbs as the chosen people, even in some representations of them as being the equivalent of the Jews suffering at the hands of external agents; this simultaneously with a dose of covert antisemitism in which the implication was that those external agents were conspiring to destroy the Serb nation, agents such as Soros (sometimes with Soros as ringleader). Not incidentally, many of the anecdotes that spatter Žižek’s writing are from a popular big book of Jewish jokes published in Belgrade in the 1970s. The defining moment of Milošević’s turn from anything approaching socialism to full-blown nationalism came after his visit to Kosovo in 1989 and his declaration in his Gazimistan speech that the Serbs must redeem their defeat at the Battle of Kosovo in 1389. This defining moment 600 years in the past functioned, according to some analysts, as the ‘chosen trauma’ of the Serbs under Milošević, and it positioned them as victims with a mission to overturn the oppression to which they had been subjected. It is a victim motif that recurs in Serbia today whenever the question of self-determination of Kosovo is raised; the spectre is raised that the Kosovans really want to take a third of Serbian territory, that there must be limits to self-determination because the Kosovans will not limit themselves to their own territory (and, alongside that argument, there is often the claim that the Kosovan territory is itself actually always already Serb). This is the soil into which are planted ridiculous stereotypes about the ‘Serbian mentality’ that some of the nationalist locals wallow in, rehearsed in many books for sale in the bookshops. As Goran Musić points out in his 2016 study (published in Serbian and English by the Rosa Luxemburg Stiftung) ‘Serbia’s Working Class in Transition 1988-2013’, there was a deadly oscillation between two different ideological strategies employed by Milošević. On the one hand, the regime, even before its disintegration in the 1980s, based its rule on the workplace units, the ‘Basic Organisations of Associated Labour’, and this economic decentralisation effectively incited competition between different enterprises (and between industrially stronger and weaker parts of the republic which eventually became configured around specific local nationalist agendas). The nomenclature positioned itself, Musić argues, as a kind of ‘social glue’, and in this way the regime was able to define the class interests of the Yugoslav working class as national interests. 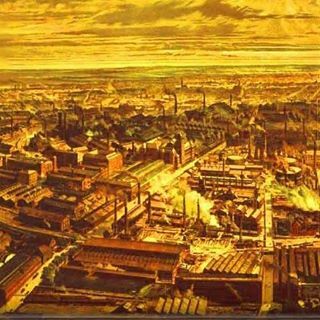 At one moment there was a call for pro-market initiatives which set different groups of workers against each other, and at the next there were attempts to define what counted as ‘working class’ around society as a whole. This oscillation and contradiction between competitive local enterprise as the basis of working-class identity and a general overarching definition of shared national identity – the shared overall project of self-management socialism – came to a head in the 1980s when the economic crisis was addressed primarily through pro-market initiatives which did explicitly set the different republics against each other and which led Serbia to define itself not only as the central guiding state apparatus but also against Croatia, Macedonia and Slovenia (which was being levered out of the SFRY through German capital investment). Musić argues that this then led to the Serbian nation emerging as the key ideological motif and strategic centre-piece for guaranteeing the power of the bureaucracy under Milošević: ‘By placing it in the role of victim of imperialism and bureaucratic machinations, the Serbian nation as a whole was assigned with attributes once reserved for the proletariat. In official language, the term ‘working class’ was starting to be used interchangeably with the term ‘Serbian people’, only to be completely overtaken by it a few years later on’. This is, indeed, one of the fruits of ‘socialism in one country’ into which is stirred the poison of victimhood and corresponding search for malevolent external forces who might be blamed for Serbia’s predicament. Musić describes the spate of factory protests and even occupations that were tangled with the privatisation process through which members of the apparatus were able to transfer ownership into their own hands, tangled with that process but unable to defeat it. Serbia’s capital Belgrade, with less than two million people, means ‘White City’, a name unfortunately relevant during the contemporary refugee crisis, and in the response of the authorities to immigrants, Kosovans and Roma. There is a small Roma and Chinese community in the city. The Belgrade Fortress at the confluence of the Danube and Sava functions as a national park laid out, the signs say, ‘in the English style’. The fortress was an Ottoman stronghold, and there are the remains of a hamam in the grounds, and the fortress then functioned as a site of resistance to the Turks and other enemies of the Serbs. The fortress area includes a military museum and, in one of the sunken moat fortifications, next to the dinosaur park (filled with not-quite lifestyle bad-animatronics) there are displays of tanks and NATO equipment seized in 1999. There is a meteorite museum which rehearses one of the commonplace plaints, with a placard inside saying ‘Unfortunately, because of everything that happened in our country over the past 100 years, the fate of these meteorites remains unknown’. On the plinth of a monument in the Fortress Park erected in 1930 in gratitude to the French for its help to Serbia during World War One was a rain-sodden poster with images of some of those murdered in the 78 days of bombing (with the names in Cyrillic) and the legend ‘NATO We will never forgive you for killing our children’. The main pedestrianised shopping street, Knez Mihailova, is lined with Western store-names, and fetches onto the nearby informal market-stalls in the grounds of the fortress which sell old Tito-era military uniform hats and party-badges, mugs with Tito’s face printed on, T-shirts with Putin on, and, next to those, some more emblazoned with images of the war criminals Radovan Karadžić and Ratko Mladić. The small town of Zemun, where now-president Vučić went to high school, is on the Danube about an hour walk from Novi Beograd, and is base of the B92 radio station, a Greek-owned outfit which was one of the sources of alternative news during the 1999 NATO bombing but which today pumps out a weird post-truth mixture of US-American programmes and pro-Putin propaganda from Sputnik. Novi Beograd, a housing and shopping complex on one side of the Sava facing the old main city of Belgrade on the other bank, also includes the SFRY old-soviet-style architect-nightmare block for what was once the Federal Executive Council of Yugoslavia (still used for public functions as the ‘Palace of Serbia’ to impress foreign dignitaries) and the League of Communists tower block which was badly hit during the bombing, and which is only a few hundred metres from housing blocks (some of the occupants of which were injured during that time). Language is one of the battlegrounds, with increasing use of English in the media, and Cyrillic is one of the markers of that battleground, indicating adherence to a distinctive ‘Serbian’ identity that has been manufactured since the split with Croatia and with the other Yugoslav republics. Once ‘Serbo-Croat’, now the digraphic language of Serbia (that is, written in two different scripts with the same meaning) is torn between the Roman script which is used in Croatia and the other ex-republics, and Cyrillic which also serves to tie Serbia closer to Russia. The political battle over Cyrillic and Roman script is over-determined by class. For example, some digraphic street-names in central Belgrade have been defaced, with stickers or graffiti obscuring the Roman version of the names. And, at the same time, the Saturday night performance of Aida in the National Theatre – a glittering golden palace of culture which packed nearly seventy performers onto the stage on one point – was surtitled in Cyrillic script. The mainstream broadsheet press is still published in Cyrillic (as is official documentation in the university), while the tabloid press, which includes one simply called ‘Tabloid’, is in Roman script. There is elaborate graffiti around the waterfront, along the Danube and the Sava which flows down from Slovenia, once the northernmost republic in the Socialist Federal Republic of Yugoslavia, including the SKOJ tagline ‘Yankees go home’ (in English) and ‘Crimea is Russian’ in Cyrillic. Most graffiti, apart from the pro-Putin stuff and some ‘freedom of movement’ slogans (in English), is non-political, including a number of brightly-coloured images with the tag-line ‘Go Vegan’ (most in English but some in Cyrillic transliterated from the English rather than in Serbian), and one of the best vegetarian restaurants – Radost House – has no public signage. Visitors wander up and down the road peering in the windows before the waiter comes out and says ‘I guess you are looking for me’. The restaurant-owner is apparently against a sign, I was told, for ‘political reasons’. The interval announcement during the performance of Aida at the National Theatre included advertising for a private health company, to the fury of some in the audience but with bland acceptance by most. Public education and healthcare are in the firing line along with housing. Now the privatisation process is being intensified, and that is another reason Merkel loves Vučić, and most of that privatisation is tied to foreign investment in Serbia, a process which also intensifies nationalist resentment and a nationalist spin on protest against finance capital. In another 2016 document produced by the Rosa Luxemburg Stiftung, Ivan Radenković’s ‘Foreign Direct Investments in Serbia’, Aleksandar Vučić is quoted as saying that Serbia’s workforce is lazy, inefficient and accustomed to working under the rules of socialist self-management, something he also refers to as ‘mob’ mentality. Against this, Vučić argues, Serbia needs a German work ethic, and foreign investment will enable this, not only through the injection of capital but also through the work discipline that will be imposed in the process. Radenković points out that, contrary to the public claims by the government, wages in foreign-owned factories in Serbia range from the minimum wage – that is very minimum – and barely 20 percent more than that. Again, the problems stem not only from the recent neoliberal turn under a far-right president, but have their roots in economic ‘reforms’ undertaken under Tito. Economic reforms from 1965 promoted integration into international markets, and amendments to the Law on the Funds of Economic Organisations in 1967 created a legal basis for importing capital in the form of joint venture investments. New laws in 1978 and 1988 enabled all kinds of foreign investments. The largest foreign investments in Serbia are now Telenor (Norwegian), Gazprom Neft (Russian), Fiat (Italian), Delhaize (Belgian) and Philip Morris (US-American). There was very little authentic socialist presence in the 2017 elections. One of the most successful fringe candidates was a comedian running for the ‘You haven’t tried the stuffed cabbage’ party. He came third with nearly ten percent of the vote. There is also a monarchist movement. In 2008 students at the University of Belgrade founded a group called King’s Youth which has now established itself as the Kingdom of Serbia Association, dedicated to restoring Prince Aleksandar to the throne in a ‘constitutional monarchy’. The Prince returned to Serbia in 2001 and lives with his wife in one of the former palaces. 123,000 signatures had been gathered by May 2017 toward the target 150,000 which, the Association claims, will enable them, without a referendum, to restore the Karadjordjevic dynastic line that ruled Serbia until 1945 when the Yugoslav Republic was declared. There is, however, also a flourishing of alternative movements and the April protests against Vučić indicate that socialism of some kind, after what one young activist described to me as the ‘dead blank years of the 1990s’, is being reborn. This includes a small Trotskyist presence, a political current demonised by the various Yugostalgic Stalinist groups. I attended a Monday evening meeting at the OCTOBAR radical space in Belgrade that brought together members of different radical social movements. The space is entered through a non-descript doorway off a side-street, down some badly-lit tiled steps and through a plate-steel door with a second intercom entry system. There was a fascist attack on the centre last year, and fascist gangs. Inside there is a bar, an open patio area and meeting rooms, and, a humanising presence in this new left space, a cat wandering about. This is one of the homes of Left Summit Serbia which brings together many of the left initiatives as well as other civic groups. We discussed the role of different social movements, including those focused on the recent election protests, and anti-demolition groups, including a quasi-environmentalist one focused on the waterfront ‘development’ which is called ‘Don’t Drown Belgrade’. This is an initiative which is part of the ‘United Civic Front’ which is routinely attacked in the Belgrade press for being small and inefficient (which begs a question as to why the press feels the need to repeatedly undermine it). The anti-demolition campaigns also mobilise in support of residents who have been subjected to forced evacuation from their homes after the transfer of social housing to private companies and the attempt by those companies to ratchet up their profits through various ‘development’ strategies, strategies that usually, not surprisingly, rely on foreign investment. The following morning, Tuesday, there was a large successful protest by some of those involved in the OCTOBAR meeting and other groups against evictions of tenants in a working-class residential area of the city. The protests go back to privatisation of housing that took place from 2000 to 2012, the period of what is known as the ‘Bulldozer revolution’. The coalition government headed by the Democratic Party together with the right and then, from 2008 with the Miloševićite Socialist Party oversaw a rapid shift to an explicitly market-oriented economy which benefitted war-profiteers, those who were able to make a killing financially from real estate. These ostensibly self-made capitalists used family and party ties with the government to secure access to properties which they then wanted to ‘develop’. One case in point was the Trudbenki construction company which was bought up in 2007 by a member of the Democratic Party who was ex-chair of Belgrade City Council and which then quickly went bankrupt after the new owner sold off its assets. The apartments had originally been built by a workers cooperative and were part of a public housing programme, but these needed to be stripped out to realise profit for the new owners. A bank now has property claims confirmed by courts and supported by the state apparatus, with a deal struck between the owner and the bank to evict thirty families and demolish the whole street. There have been numerous threats against the tenants, and they have had to pay huge court expenses already as well as fines of 5,000 to 10,000 Euros for each household because they live there without permission. This for residents that include pensioners who now receive only 40 Euros a month following government cuts, an austerity agenda demanded by private banks and by the EU. The government is keen to bow to the diktats of the IMF, and is seen by the left as being ‘more IMF than IMF’. The protest, which included anarchists and neighbours, stopped the eviction, deterring the twenty police sent over that morning. The bailiff didn’t appear, and now the owner apparently has no obligation to send notice of the next eviction attempt. Fascist groups which attack the left and LGBT initiatives are also used by private contractors to beat back civic protests. Feminism and queer politics was present in Left Summit Belgrade, and is, activists at the OCTOBAR meeting claimed, woven into the fabric of the new movements, and not necessarily needed to be declared as a separate resource; there was an immediate intuitive resonance with debates about ‘intersectionality’ that evening. In fact, one of the first national groups in the International Socialist Tendency (IST) to publicly object to the crisis over sexual violence in the British SWP – the group which effectively controls the IST – was the Belgrade-based Marks21. Unfortunately Marks21 could not resist put programmatic demands to the Left Summit Serbia as a condition for staying involved, and left the alliance when their demands were refused. Even so, they were invited to the OCTOBAR meeting, and are part of the protests against the rigged election. There is a grim history, but there are, in this difficult context, signs of resistance. There has always been resistance in Serbia, just as there was resistance at the heart of US-American imperialism during the Vietnam war when youth refused to sign up to fight. In Serbia there were over 300,000 deserters from the fighting in the 1990s, and the response to call up to the armed forces was only 50%, and only 15% in Belgrade. When deserters sought refuge in other countries of the EU they were not treated as refugees, but returned to Serbia. The struggle of refugees is always a struggle for the rights of the oppressed, and Serbia is another case in point. There are now also signs of the development of a political tradition that can draw an honest balance-sheet of the successes and failures of ‘socialism’ in Yugoslavia and build alliances through which socialism might actually eventually realise itself there. ← More than voting now!